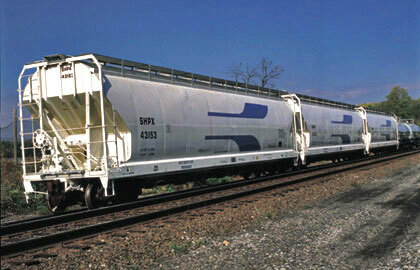 SMBC Rail's Covered Hopper Cars are used for the transporting of commodities such as grains, plastic pellets, cement, flour, sugar and various minerals. SMBC Rail's Pressureaide pressure differential Center Flow covered hopper car is designed to handle dry bulk commodities. With operating pressures up to 14.5 psig, fast, efficient unloading for long distances can be achieved. Unloading rates up to 100,000 lbs/hour may be obtained depending upon the commodity and unloading system. The Pressureaide car has many of the famous Center Flow car design features: centerline loading, unloading, complete sanitation and ease of operation. Designed to operate with standard positive displacement blowers, this car may be used with equipment compatible with pressure sleds. As safety is a prime consideration for SMBC Rail's, the Pressureaide car is equipped with two pressure relief valves, a rupture disc and a vacuum relief valve. The Pressureaide car is unmatched by any railcar in its class when it comes to sanitation, maintenance and unloading performance. 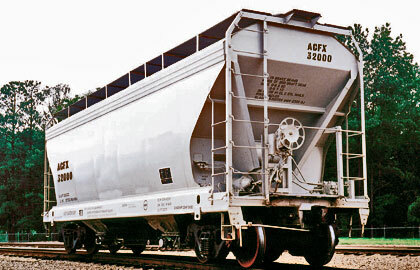 The Model 3200B Center Flow® covered hopper car is specifically designed to transport medium density commodities, up to 63 lbs/ft3. The car can be equipped with any series of loading hatches and discharge outlets depending upon your handling requirements. In addition, the car can be built for a gross rail loading of either 263,000 lbs. or 286,000 lbs. For your application and troubleshooting needs, the Center Flow® covered hopper car has the complete backing of the SMBC Rail Services staff. With over 100,000 cars built to date, the Center Flow® covered hopper car has the proven service history that is so critical for today’s transportation. The standard 3200B Center Flow® car is equipped with four 30 inch diameter round steel hatches. This is the hatch of choice for this size car and is suitable for loading a wide range of general service commodities. If desired, alternate types of hatches are available to adapt to your specific loading system or product. There is a Center Flow® unloading system specifically tailored to your lading type or unloading facility. They range from the standard controlled gravity gates for general service to ultra-sanitary outlets for products extremely sensitive to contamination. Specialty outlets are also available for hard to handle powders and sparger/solution type systems. The Model 4650C Center Flow® covered hopper car is specifically designed to transport medium density commodities, up to 43 lbs/ft3. The car can be equipped with any series of loading hatches and discharge outlets depending upon your handling requirements. In addition, the car can be built for a gross rail loading of either 263,000 lbs. or 286,000 lbs. For your application and troubleshooting needs, the Center Flow® covered hopper car has the complete backing of the SMBC Rail Services staff. With over 100,000 cars built to date, the Center Flow® covered hopper car has the proven service history that is so critical for today’s transportation. The standard 4650C Center Flow® car is equipped with six 30 inch diameter round steel hatches. This is the hatch of choice for this size car and is suitable for loading a wide range of general service commodities. If desired, alternate types of hatches are available to adapt to your specific loading system or product. The Model 5150C Center Flow® covered hopper car is specifically designed to transport medium density commodities, up to 37 lbs/ft3. The car can be equipped with any series of loading hatches and discharge outlets depending upon your handling requirements. In addition, the car can be built for a gross rail loading of either 263,000 lbs. or 286,000 lbs. For your application and troubleshooting needs, the Center Flow® covered hopper car has the complete backing of the SMBC Rail Services staff. With over 100,000 cars built to date, the Center Flow® covered hopper car has the proven service history that is so critical for today’s transportation. The standard 5150C Center Flow® car is equipped with six 30 inch diameter round hatches. This is the hatch of choice for this size car and is suitable for loading a wide range of general service commodities. If desired, alternate types of hatches are available to adapt to your specific loading system or product. The Model 5250C Center Flow® covered hopper car is specifically designed to transport medium density commodities, up to 38 lbs/ft3. The car can be equipped with any series of loading hatches and discharge outlets depending upon your handling requirements. In addition, the car can be built for a gross rail loading of either 263,000 lbs. or 286,000 lbs. For your application and troubleshooting needs, the Center Flow® covered hopper car has the complete backing of the SMBC Rail Services staff. With over 100,000 cars built to date, the Center Flow® covered hopper car has the proven service history that is so critical for today’s transportation. The standard 5250C Center Flow® car is equipped with eight 20 inch diameter round single strap hatches which are preferred for loading most general service commodities. If desired, alternate types of hatches are available to adapt to your specific loading system or product. The Model 5711C Center Flow® covered hopper car is specifically designed to transport low density commodities, up to 35 lbs/ft3. The car can be equipped with any series of loading hatches and discharge outlets depending upon your handling requirements. In addition, the car can be built for a gross rail loading of either 263,000 lbs. or 286,000 lbs. For your application and troubleshooting needs, the Center Flow® covered hopper car has the complete backing of the SMBC Rail Services staff. 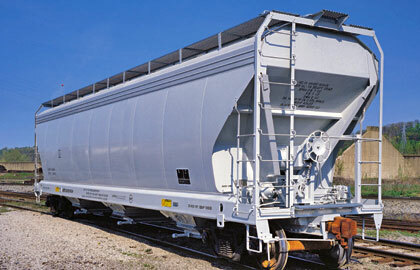 With over 100,000 cars built to date, the Center Flow® covered hopper car has the proven service history that is so critical for today’s transportation. The standard 5711C Center Flow® car is equipped with ten 20 inch diameter round single strap hatches which are preferred for loading most general service commodities. If desired, alternate types of hatches are available to adapt to your specific loading system or product. The Model 6201C Center Flow® covered hopper car is specifically designed to transport low density commodities, up to 32 lbs/ft3. The car can be equipped with any series of loading hatches and discharge outlets depending upon your handling requirements. In addition, the car can be built for a gross rail loading of either 263,000 lbs. or 286,000 lbs. For your application and troubleshooting needs, the Center Flow® covered hopper car has the complete backing of the SMBC Rail Services staff. With over 100,000 cars built to date, the Center Flow® covered hopper car has the proven service history that is so critical for today’s transportation. The standard 6201C Center Flow® car is equipped with ten 20 inch diameter round single strap hatches which are preferred for loading most general service commodities. If desired, alternate types of hatches are available to adapt to your specific loading system or product. The Model 6500 Center Flow® covered hopper car is specifically designed to transport low density commodities, up to 32 lbs/ft3. The car can be equipped with any series of loading hatches and discharge outlets depending upon your handling requirements. In addition, the car can be built for a gross rail loading of either 263,000 lbs. or 286,000 lbs. For your application and troubleshooting needs, the Center Flow® covered hopper car has the complete backing of the SMBC Rail Services staff. 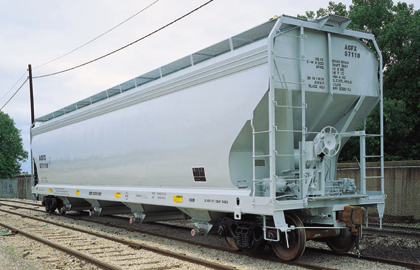 With over 140,000 cars built to date, the Center Flow® covered hopper car has the proven service history that is so critical for today’s transportation. The standard 6500C Center Flow® car is equipped with ten 20 inch diameter round single strap hatches which are preferred for loading most general service commodities. If desired, alternate types of hatches are available to adapt to your specific loading system or product.